Miles, now ROMAN, is very special to our rescue. He was saved just 30 minutes before being euthanized at Miami Animal Control. When we picked him up he was covered in urine and very anxious. He was nervous being handled and didnt want to get into the car, the idea of freedom hadnt hit him yet. He was transferred to his foster family until an adopter could be found. The foster family helped rehabilitate him and helped him trust humans again. He was progressing very well and soon became a couch potato. He loved playing fetch and chewing on his favorite treat, BONES! We received a call from Amanda and Mark, who had seen Miles picture online and had to meet him! We brought him over for a meet and greet and they hit it off right away. He was excited to be in a new home and meet their dog Laila! The decided right there on the spot they wanted to adopt him! Miles needed a bit of training and they had a trainer come the very next day to start the work. Miles is very lucky to have them, they are dedicated, passionate and truly love him. It is a perfect match, and we couldnt be happier for them. THANK YOU Amanda and Mark, you saved his life. Buddy was saved from a high kill shelter and brought to our rescue. He was covered in ticks and fleas, but we soon got him cleaned up and ready to find his furrever home. He was debuted at our California Pizza Kitchen event and was a huge hit! Everyone loved him, he was a ball of fun and ravishing in all the attention he was getting. He soon had special visitors come to see him, the Moreira family. Their daughter had previously adopted Hopper, the 9 year old Puggle, and they were looking to rescue another! They fell in love with Buddy right away and had to have him! After the application process, he was officially adopted. 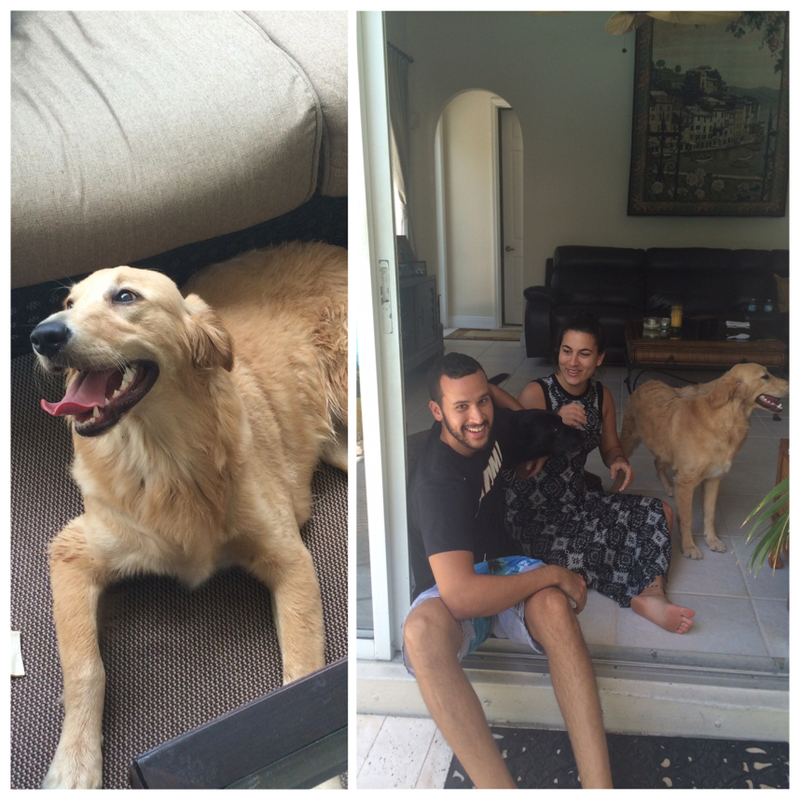 We couldnt be more thrilled with his new home, hes going to have an amazing life with this rescue loving family! Mini was a 7 year old Sheltie given up by her owners. She was a wonderful little girl, looking for a happier second chapter of life. We only had her about 3 days before a women named Lynette saw her picture online and raced over to an event we were having to meet her! It was love at first sight, they had an instant connection. After the application and home check, Mini officially had a new home. Lynette said after just a day, Mini wouldnt leave her side. THANK YOU Lynette for giving Mini the life shes been deserving. Hopper, the 9 year old Puggle came to us as an owner surrender due to his owner having to move into hospice care. We were heartbroken over the situation and wanted to do anything we could to help. We got Hopper vetted, bathed and ready for his foster mom, Daniella. He was very confused and a little apprehensive at first to all the new people, but quickly adjusted with Daniella. We posted pictures of Hopper on our social media, we predicted we would have Hopper for quite a while due to his age, but we were wrong! Jessica and Alex called and wanted to meet him! They had been wanting to rescue a senior dog, saw his photo and fell in love! This match was meant to be, they have a 3yr old Puggle named Dexter and they got along great, Hopper loved having a new little brother to hang out with all day! THANK YOU Jessica and Alex for rescuing Hopper, he is truly lucky to have you! Fraiser, whos shelter name was WINKIE, is a sweet Karin Terrier mix, missing one eye. He was saved from a local high kill shelter and was thrilled to be out! He had been a stray and was severely underweight. Home life was a new experience for Fraiser, he was provided with a nice soft bed, but preferred sleeping on the floor. Drew and Rob, friends of our rescue, saw his picture online and had to meet him! We brought Fraiser over for a home visit and he instantly felt right at home. Drew and Rob loved his personality and of course his cute “Winking eye” Thank you Rob and Drew for rescuing this sweet boy, hes very lucky to have you! 2 year old Zeus came to us as an owner surrender. The previous owner rescued him as a puppy and her living arrangements drastically changed, and she could no longer care for Zeus. We picked him up from Ft Pierce, Florida and fell in love immediately. He was not in the best shape when we got him. He was covered in fleas and infected flea bites, but that didn’t slow him down, he was the happiest little guy we had ever met! 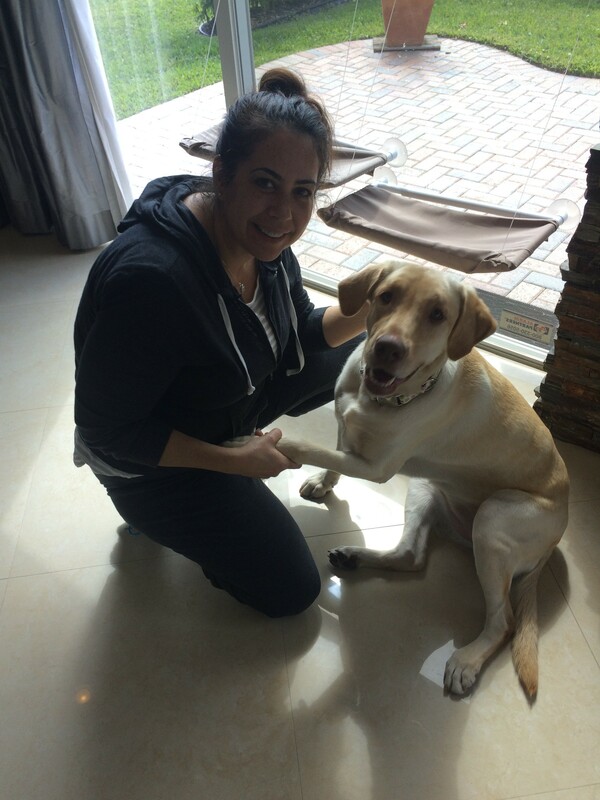 He was generously fostered by Lauren and Cley who started training and loving him. He had a few interested adopters, but Zeus needed a little more socializing to get him ready for a forever home. While working with him, fosters Lauren and Cley couldn’t let him go! They wanted to adopt him, they were “Foster Failures” 🙂 and we couldn’t be happier about it! Zeus now has a fabulous life with Lauren, Cley and their rescued Frenchie, Cali! Lilly was found as a stray in Delray Beach. She was roaming the streets, confused and looking for someone to save her. A woman picked her up, and after a couple weeks of looking for a possible owner, she called us. We picked Lilly up, checked for a microchip and no luck. She was thrilled to be off the streets and in a safe loving home. We got her up to date on her vaccines and ready to find her forever home. It didn’t take long for a man named Anthony to come along and fall in love with her. 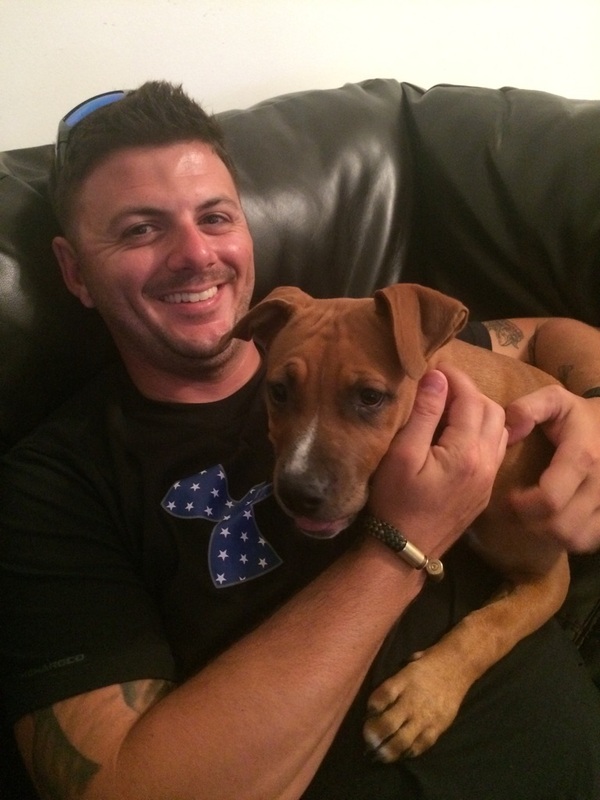 He lives in Palm Coast with his rescue pup Gemma, and wanted to add to the family. He has a large fenced in yard and lots of time for training, we knew it was a perfect match! 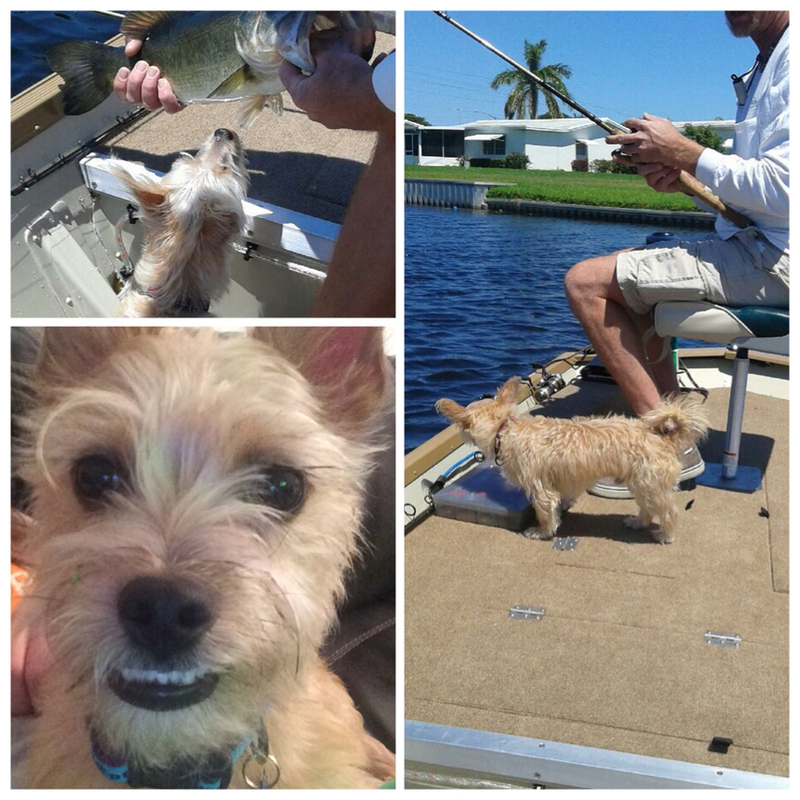 Lilly, now named “Jasmine”, is living the life in Palm Coast with her new dad, Anthony and new doggie sister, Gemma! 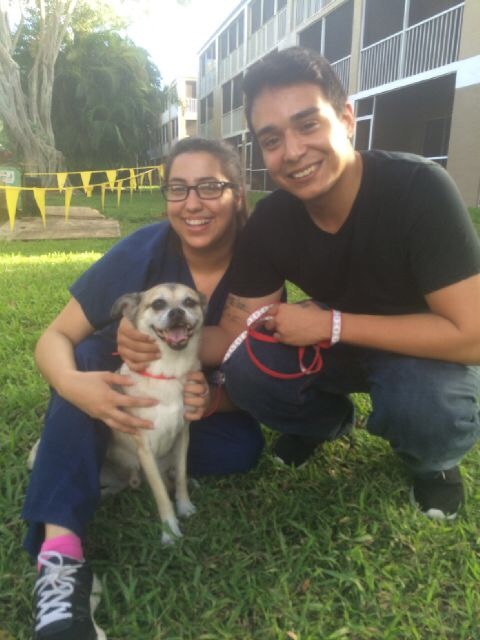 Zoey was picked up in Miami by a sweet family who had found her laying at their doorstep. Instantly they thought this had to be someone’s lost puppy, but sadly signs and postings online turned up no one claiming this sweet little girl. After a month of trying, they called our rescue to find her a loving home she so desperately deserved. At only 3 months old, this little girl was most likely an escapee from a backyard breeder and we were determined to find her the perfect home. We got her vetted and ready, and fosters Bonnie and Ken started her on some basic training. 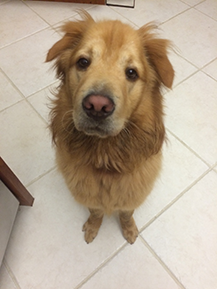 After 2 weeks we got a phone call from Tatiana in Jupiter who said “I don’t know how I came across Zoeys picture or how I started following your rescue on Instagram, but this is meant to be, I have to meet Zoey, is she still available?” She quickly filled out the application and we set up a time for everyone to meet. We drove up to Jupiter with Zoey and when we arrived Tatiana picked up Zoey and it was an instant connection! Husband Sean was walking their dog Mocha at the time and when he came back they both fell in love. 5 year old mocha was very submissive and excited to have a new friend. It was clear however, Zoey was going to call the shots. We knew Zoey was in good hands, and left her that day with her new family. Zoey is very lucky to have a fun, energetic couple to give her the furrever home she deserves! Thank you Tatiana, Sean and Mocha for rescuing this sweet baby girl! Shirley (now named BELLA) found a wonderful home with the Chong family. Shirley was generously fostered by Daniella and she worked with her on some training and timidness, and Shirley learned very quickly! We received a phone call from Joeseph Chong who was very interested in meeting Shirley, and asked if we could bring her over. We arrived with Shirley at the Chongs and she felt right at home! We all went outside by the pool and Shirley was having a blast! She even went for a quick swim! It was a perfect match, Shirley was very comfortable and the family LOVED her. 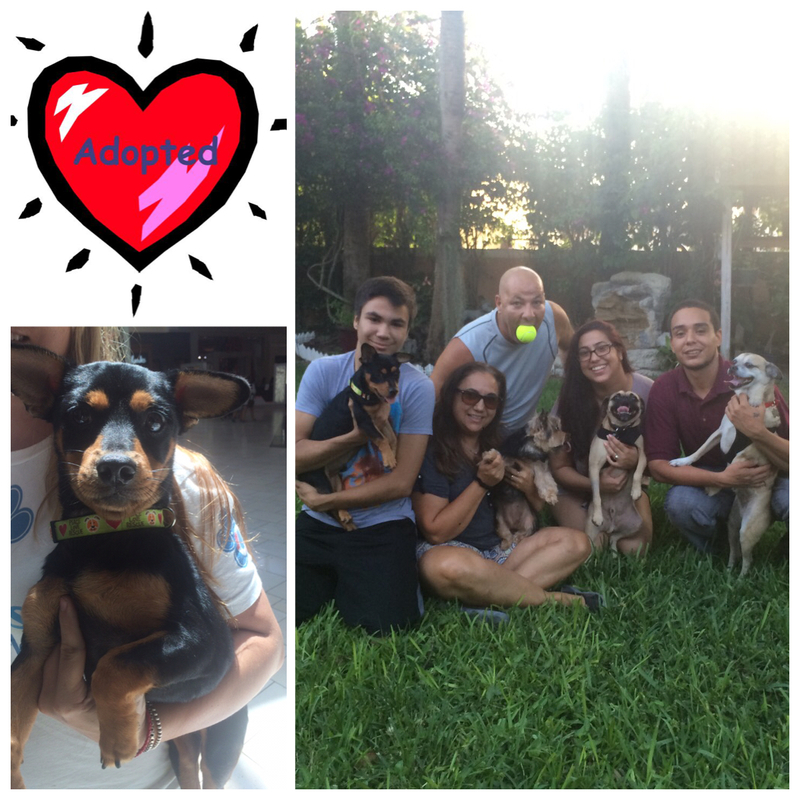 THANK YOU to the Chong family for rescuing Shirley, shes going to have a wonderful life! We rescued Pumpkin and Cody from a man in Miami who called us with a story about getting kicked out of his apartment and he would have to take both pups to Miami Animal Control by end of day. 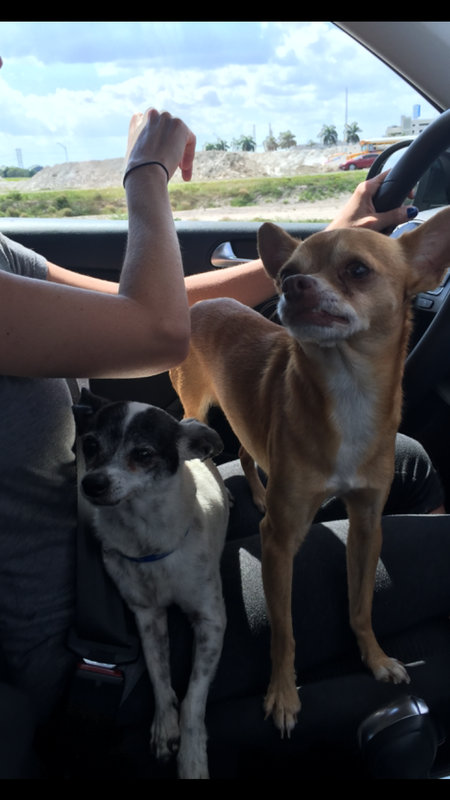 We raced down to Miami to get these poor guys before they ended up in the shelter. When we got to the home where they were, a man came out carrying a crate with two frightened Chiuahahs inside. He slammed the crate with the dogs inside, on the sidewalk and said “thanks” We were mortified, these poor babies looked terrified and abused. They were extremely underweight and both had rotting teeth. We quickly picked up the crate and raced out of the neighborhood. We pulled over a few blocks down the road and took them out of the crate (put together with rusting barbed wire) and placed them on our laps. They knew they were safe now. A few minutes into the drive home, they started wagging their tails and looking out of the window. We took them straight to the vet to get heart worm tested and vaccinated. Our vet informed us that both pups were underweight, about 2 years old and Pumpkin had rotting teeth and gum disease. We held them overnight before they went to Aixa, a foster volunteer the next day. Both Cody and Pumpkin warmed up with our foster and learned that there was nothing to be frightened of anymore. CODY: We received a call from a man named Dennis that had seen Cody on our website. He has had Chiuahahs his whole life and was very familiar with the breed. He came to the Boca Green Market to meet Cody and filled out an application on site. Cody was a little skittish at first but Dennis knew he could get him to warm up. We took Cody to Dennis place a few days later and he instantly began exploring his new home. Dennis makes homemade dog food and already had some ready for Codys first dinner in his new home. Thank You Dennis for rescuing this sweet boy, he was so lucky to have found you! PUMPKIN: Pumpkin was quite a challenge. He suffered from collar aggression, which meant anytime you got close to his neck, or collar or tried to put on a leash for a walk, he would bite. We worked with him several times a day, trying to get him comfortable with someone coming close to his collar. It was training that needed to be continued long after adoption. He was very sweet and loving. He would follow us around everywhere we went and had these eyes that would just make you melt! We received many calls for Pumpkin, but once we revealed his slight aggression, a lot of people were naturally apprehensive or didnt have enough experience with the breed to be able to continue working with him. Weeks after continuously posting pictures and flyers for pumpkin we finally received that magic phone call. Michelle from West Palm, was very experienced with Chihuahuas, in fact she used to rescue them and find homes for them from Palm Beach Animal Control. I told Michelle about the aggression and she said it would be no problem, and wanted to meet him! The same day she called, Pumpkin was at a vet appointment getting some of his teeth pulled and neutered. I told Michelle it would be a few days of recovery before we could bring him by. She texted us everyday checking on his status, and to see how he was feeling. She was so sweet to have done that without even meeting him yet! The day finally came when Pumpkin and Michelle could meet. They had an instant connection, she had sliced chicken ready to give him to begin building trust. She picked him up and immediately took off his collar and put it back on. He growled a little, but Michelle said she will start working on the collar aggression right away and she had dealt with a similar personality in the past. It was truly the perfect match, we happily left Pumpkin with Michelle and are confident Pumpkin is in amazing hands! THANK YOU MICHELLE for rescuing this sweet boy! Dexter was an owner surrender by a couple that couldn’t bare the thought of keeping their sweet little puppy locked up in a cage anymore. They both worked full time, and Dexter was basically living in his crate. I went to pick him up and he was severely thin and scared. We took him immediately to the vet and had him checked out and vaccinated. Foster mom and board member, Lauren, took him in and gave him all the love that he had been missing until we found the perfect home for him. She started him on some basic training and he quickly warmed up. A week later, we took him to the Coral Springs Green Market to get him some exposure and a women named Christine fell in love with him. She had been looking for a rescue for a long time and as soon as she saw Dexter and his amazing smile 😉 Christine was hooked. She officially adopted Dexter a couple days later and now he’s the king of the castle! Christine and her boyfriend Jon take Dexter on long walks and he even gets to go bass fishing on their boat every weekend! 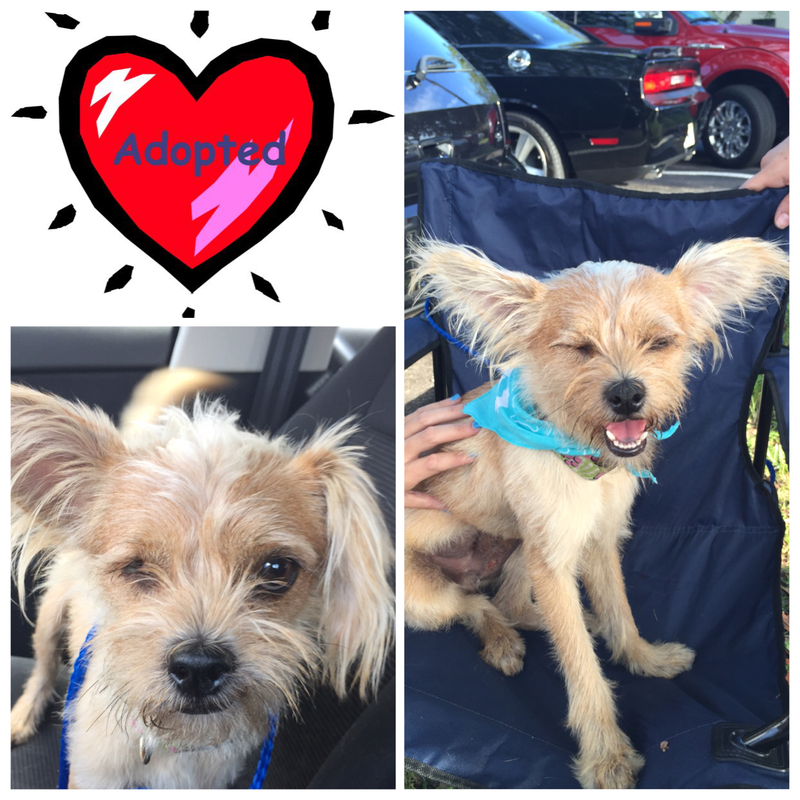 Thank you Christine and Jon for rescuing this sweet baby boy, we’re sure he will be spoiled rotten! Snoopy came to us at 7 years old. He was an owner surrender from a family that purchased him as a puppy and could no longer care for him. For the first few days he was scared and confused. 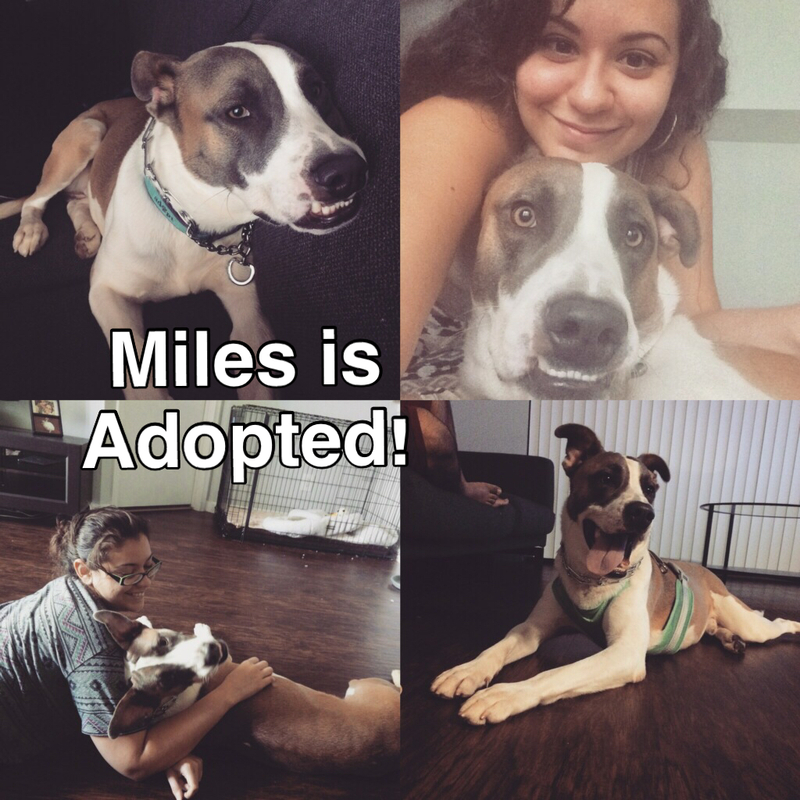 We began working with him right away to make him feel more comfortable with his temporary living arrangements while we searched for a perfect forever home. It took some patience, but we finally received the perfect phone call. Tanis and Dwayne are a wonderful couple and true Chihuahua lovers! They knew the breed very well and wanted to meet Snoopy! We went over to their home so everyone could meet and it was love at first sight! Snoopy quickly warmed up to them and confidently went exploring all around their home. It was a match! Tanis and Dwayne adopted him on the spot. THANK YOU Tanis and Dwayne for giving this beautiful boy a second chance at life. Daisy was found as a stray in Miami and surrendered to our rescue by a couple who didn’t have the room to keep her. She was 55 pounds of pure joy when we had her. She was a year old but acted very much like a puppy and needed a lot of training. A women named Nicole called us and wanted to meet her, she had been looking for a dog for over a year and saw Daisy’s flyer hanging at a local Starbucks. She came over and walked Daisy around the neighborhood and fell in love. She was officially adopted on Valentine’s Day! When we brought her over, The Stelzers had all of Daisys new toys laid out and the backyard ready for her to play. 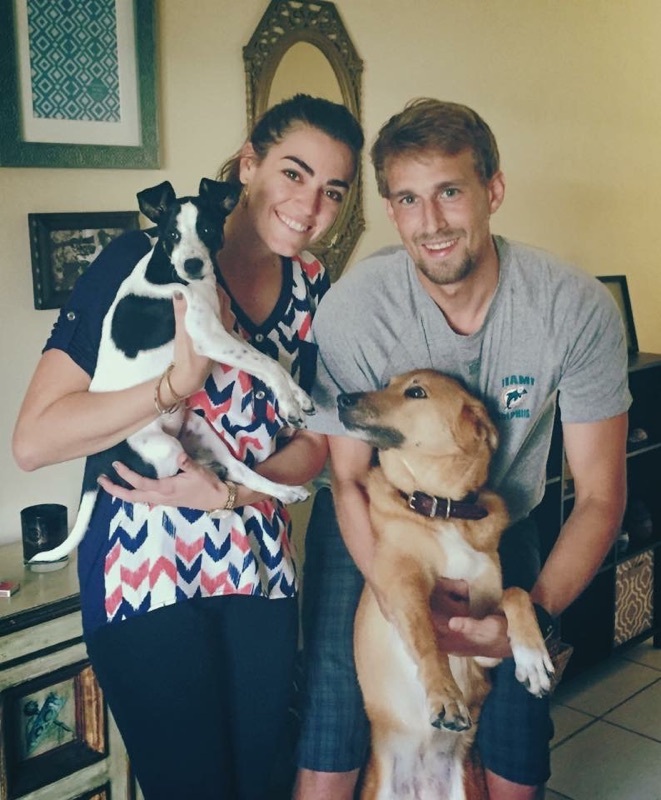 Daisy is so lucky to have found such an amazing family to care for her, from a stray on the streets of Miami to loving arms on Valentine’s Day. Thank you to the Stelzer family for rescuing this beautiful girl. Dixie was brought to us as an owner surrender. The family could no longer look after her due to having another, older dog in the house. When we picked her up we were instantly putty in her paws. She was extremely sweet and an amazing playful personality. It was clear after our first walk however, that she needed some basic leash and command training. She was fostered by Laurie, and they were instant buddies. She worked with Dixie on some leash training and basic commands and Dixie was a quick learner. We then started searching for a home for this beautiful Lab. We received a facebook message from a women named Deborah who had been looking for a big breed rescue, and asked if Dixie was still available. She filled out an application and quickly set up a time to meet Dixie. It was love at first site. Clear that Dixie still needed some training Deborah agreed to sign her up right away for training sessions. (Later we found out she signed Dixie up for Cesar Milans training classes!!) 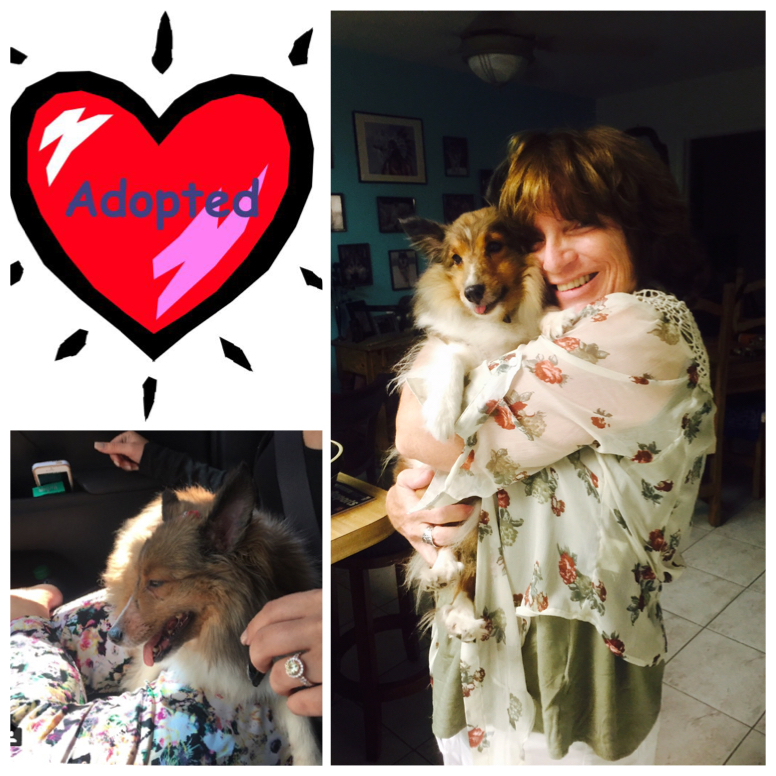 Dixie has a wonderful life with Deborah, we are so grateful to have found such an amazing women to work with Dixie and give her the amazing life she deserves. THANK YOU DEBORAH! We thank you for coming to visit our website and for your interest in Animal Rescue of South Florida. Thank you for all of your support, we couldn’t do it without you! 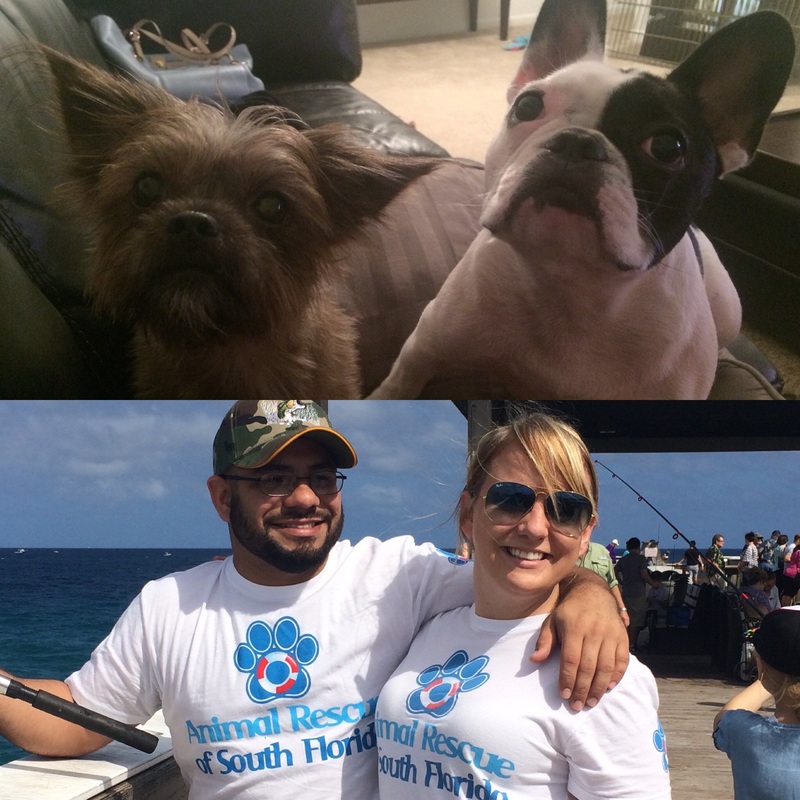 Animal Rescue of South Florida is run entirely by compassionate professionals who volunteer their time and open up their homes as foster families in hopes that every animal is adopted into a loving forever home.